Inside: Do you need a shirt that covers your bum and you feel comfortable in? Here you go! 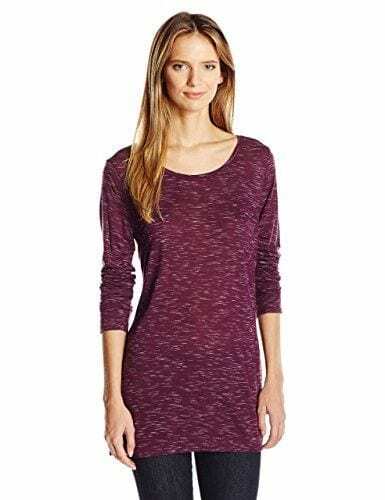 These are some of the best tunic tops to wear over leggings. She was referring to the What to Wear With Leggings This Fall feature and while I’m not much into fashion rules, this is one I stand by both personally and when sharing fashion tips. When you’re wearing leggings and your bum is covered, it just looks better. Now, leggings aren’t for everyone. And I only say this because not everyone likes them or feels comfortable in them. I was late to the leggings party and the older I get, the more I question if I should wear them or can pull them off at all. And I say yes, yes you can! You’re never too old for leggings. It just all depends on what you feel good in and also how you go about wearing them. I remember reading an article in 2015 titled ‘What Items You Shouldn’t Be Wearing After 30‘ and yes, leggings were on that list. So this was my response to that article on my 40th Birthday: It’s My Party and I’ll Wear Leggings If I Want To. Take that fashion advice articles! Ha! Now that I am traveling full-time I do most of my clothes shopping on Amazon. I don’t like trying to find a store in a new town. I prefer to have my new clothes waiting for me when we reach a new location. I recently did some Amazon shopping for fall and was greeted with a package when we arrived at our destination in San Francisco. I actually did this quite a bit before we hit the road full-time because I prefer to online shop. Needless to say, I’ve gotten to know the Amazon Fashion shop really, really well. As I mentioned, these brands are only available to purchase if you’re an Amazon Prime member. If you’re not a member and you’d like to try it out, you can do so FREE for 30 days by signing up here. Along with being able to purchase Prime exclusive apparel, you also get free 2-day shipping, free unlimited photo storage and free movies/music to stream. 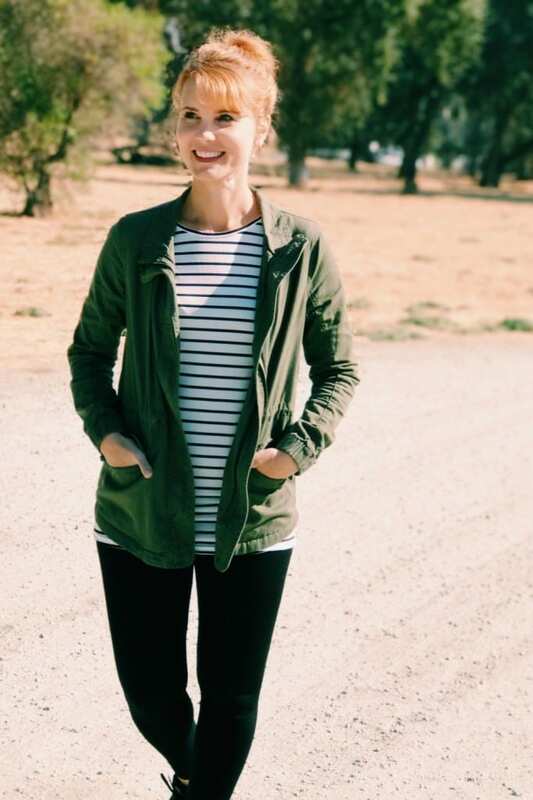 I’ve been on the hunt for a black and white striped tunic top that I could wear with leggings and skinny jeans. I recently ordered this one, which is the one I’m wearing in these pictures, and I am really happy with it. It’s a bit silky, so it’s incredibly comfortable. Although the description says it’s not see through, it is a little bit, so I wear a cami underneath. It’s long enough to wear with leggings and lightweight enough to wear under a coat or vest. It was recommended to order a size up and I’m glad I did. (I’m wearing a medium.) Just know that this top is made for a tighter fit, so it conforms to the stomach and buttocks. I also ordered my leggings from Amazon in a three-pack. They are seamless and lined with a cozy fleece inside, so they’re quite warm. They also feature a high waist compression top, which helps hold in all the things. 😉 I almost feel like I’m wearing pants instead of leggings. These leggings are very slimming and incredibly comfortable. I can see myself living in these throughout the fall and winter. 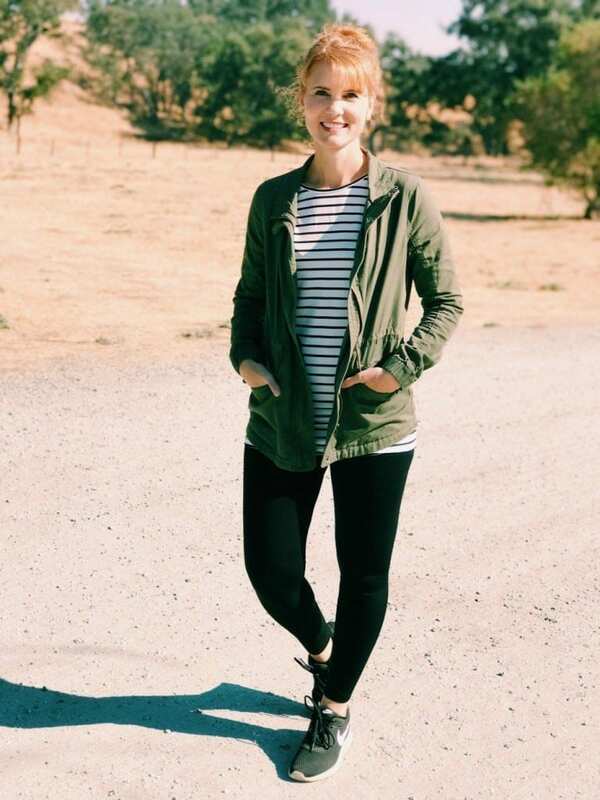 My utility jacket is an oldie but goodie and I’m wearing my go-to pair of tennis shoes – Nike Women’s Tanjun Running Shoes. I’ve done more hiking than running in these and they have served me really well. 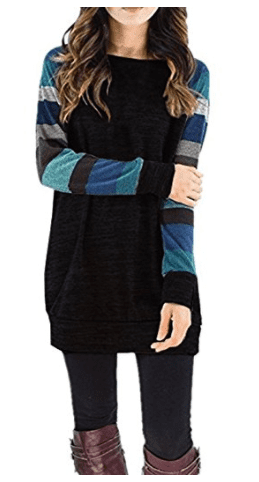 Here are a few more tunic tops that are perfect to wear over your leggings. Happy browsing! P.S. I’ve also linked to Plus Sizes below since some of you have requested that. And keep reading for tips on how to choose the best tunic top for your body shape. Pear: Look for a tunic with side slits and make sure it sits either above or below your widest area and not right at. 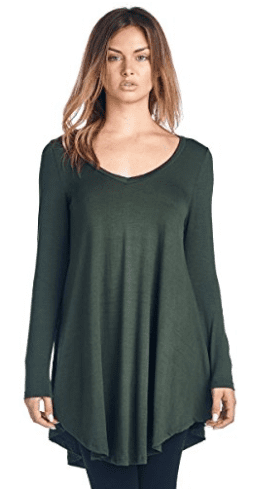 Hourglass: Go for a fitted tunic and not one that will swallow you up. Full-Figure: Similar to the hourglass figure, you don’t want a tunic that will look like a tent or a potato sack. Find a good balance between loose and fitted. Apple: It’s best to stay away from clingy, fitted tunics. Apple shapes look great in a v-neck style tunic with a short necklace. 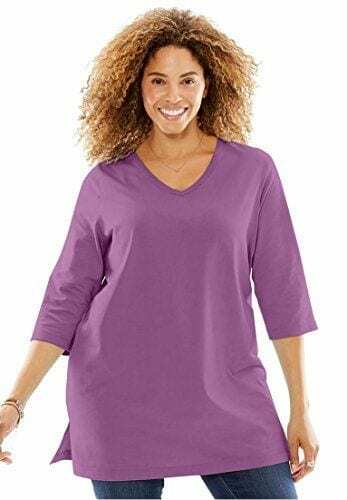 Rectangle Shape: Find a tunic with a drawstring waistband to give your body definition and shape. Petite: Pay close attention to the length of the tunic and opt for one that’s a little shorter, unless you want to wear it as a dress. 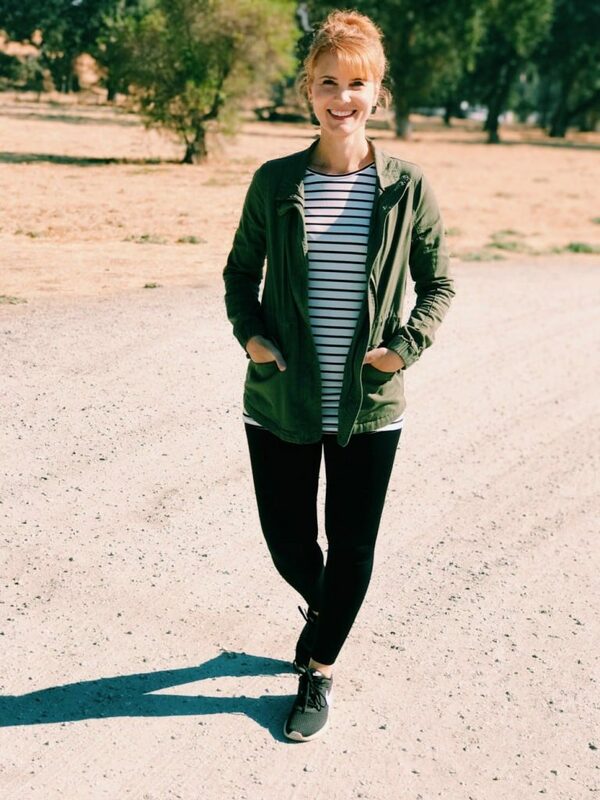 One can do so much with a striped top and olive utility jacket. You look fantastic. 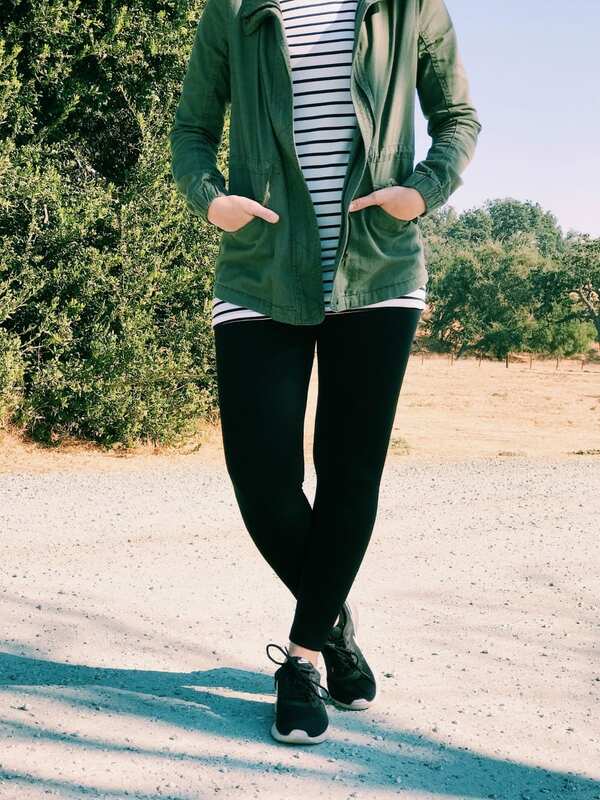 Super casual yet put together.